The manipulator is a versatile grip tool to swiftly move, rotate, scale and mirror selected entities. Holding down the Ctrl-key when starting the action keeps the original entities, thus creating a copy. Upon selecting an entity, the manipulator is displayed at a user-controlled location and orientation. The location and orientation are controlled in a similar way as for a dynamic UCS. 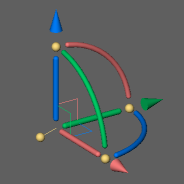 When multiple entities are selected simultaneously, the manipulator initially is placed at their geometric center. When a selection is built up step by step, the initial location of the manipulator is preserved. The manipulator can easily and directly be dragged to any desired location or orientation using its handles. 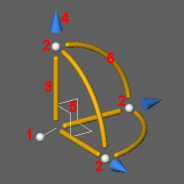 Depending on the operation type and if dynamic dimensions are active, a dynamic entry field is available to set the distance, angle or scale factor. 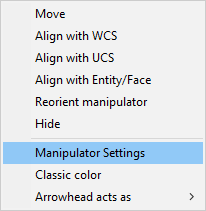 Choose Manipulator Settings in the context menu.